I enjoy looking at harvest pictures from your part of the country Ray. Always amazes me how those machines perform on those slopes. Not so sure I would want to pilot one on some of those hillsides, may have to have the factory plastic on the seat. 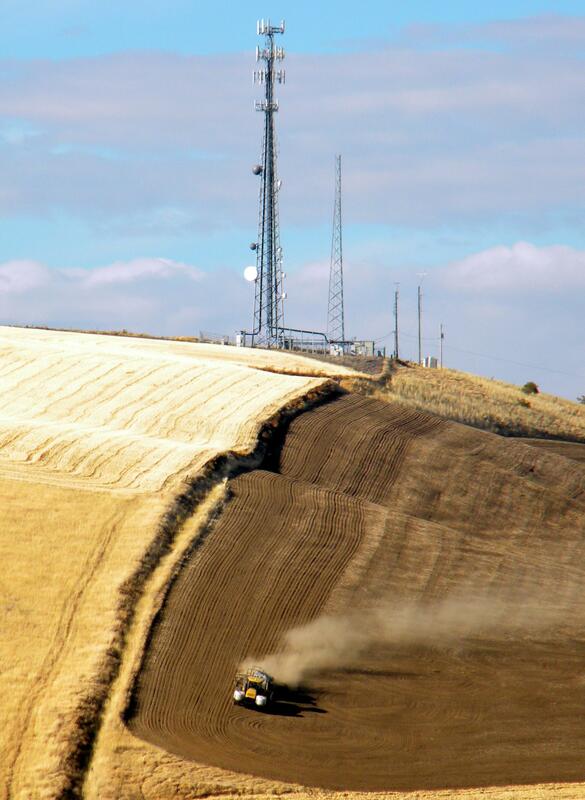 Your mad enough harvesting the grain off those hill, but towing a baler as well - thats just showing off! You ought to come see the country sometime. We have one visiting here now that asked about it a year ago on this forum and he is in the area for nearly two weeks enjoying the country. He said the pictures are nothing like real life. We have him scheduled to ride in all the brands of combines and seeing other farm operations as well as getting some fishing in down the road. He is doing this for his 70th birthday. He has a big grin on his face all the time. As far as seeding just put the drill in and go and try to stay ahead of it usually works best. I hate when it tries to pass you. gm, Bluesman63 and SWFarmService like this. Wouldn't it be easier to farm in the valleys and leave trees up top on the higher hills. It's always cool to see pics from that part of the country. 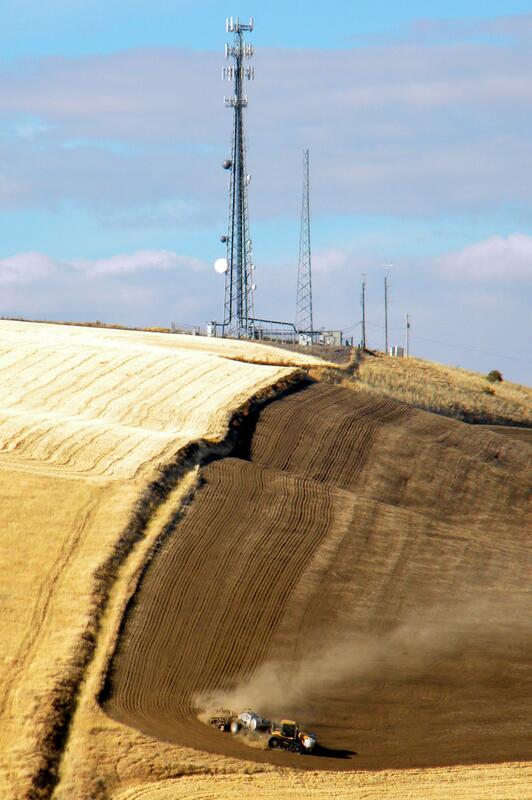 My dad and I took a bike trip through the eastern part of Washington in 2010 and its amazing to see where a combine can go. The farmers down there are more than happy to take you for a round or two. Does the Gleaner in the picture have the hillside stuff on it? You have no idea how much I would enjoy that! Only one prob, our seeding and harvest dates I believe line up almost exactly, if I could talk the old man into cutting back on wheat acres I would love to take ya up on that offer! No hillside leveling on that Gleaner. There was one R72 demonstrator with a Hillco leveler on it about 15 years ago but I don't think it resulted in any sales. Glenn probably has more info on it. 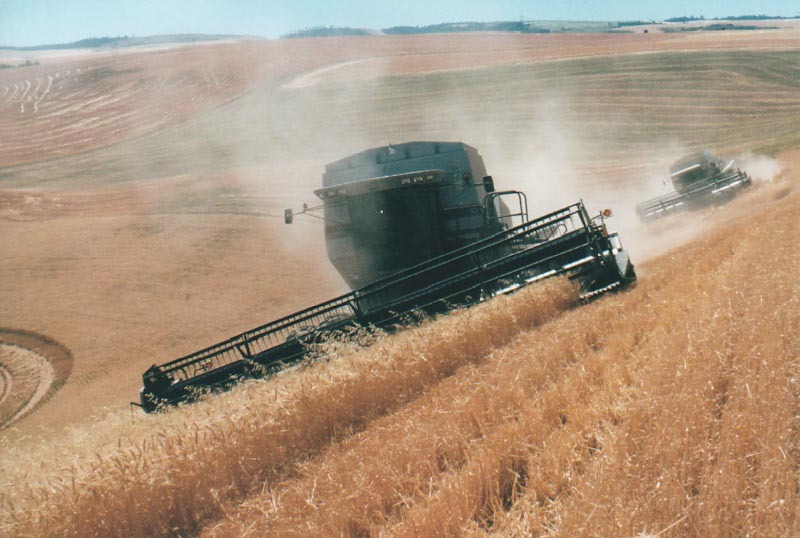 Here's a pic of Glenn operating the "Leaner Gleaner" demo unit around 1999 or 2000. Here's a couple shots I took last year of some hillside seeding above town. cat man and SWFarmService like this.